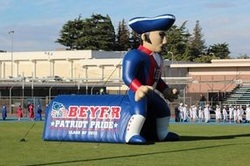 The Beyer High School Mascot is a great way to represent the school and demonstrate school spirit. The mascot stands 25 feet tall, is 25 feet long and has a 7 feet high tunnel attached. It is available for all school sponsored events throughout the year. It can be reserved on a first-come first-served basis. Fill out the form below to reserve the Mascot. Fill out the form below and submit it for approval. All fields are required. Please include the school event along with the date and time you would like to reserve the Mascot.